As for why Sheffield Labour did so badly when this local election was supposed to result in a national Tory bloodbath with Labour expected to pick up hundreds of seats and dozens of councils, especially in London, none of which actually happened. Well, what the pollsters and pundits forgot was that these were LOCAL elections and where Sheffield is concerned the KEY ISSUE was the Labour councils tree felling rampage, one of 6,000 trees felled to date and ultimately to target the felling of HALF of Sheffield's street trees that galvanised thousands of Sheffielders to come out onto the streets and protest against the insane actions of the Labour council and it's contractor who remained in state of denial of what the people of Sheffield actually wanted to happen on their streets i.e. to FIX the POTHOLES! 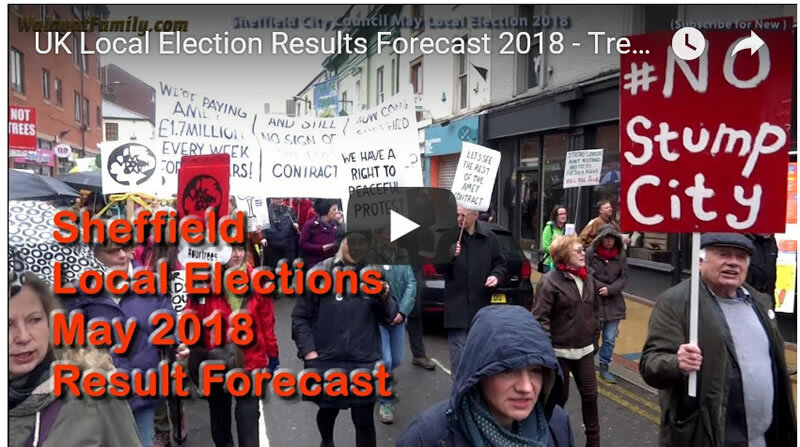 Rather than FELL healthy street TREE's was the protest cry echoed at Sheffield tree felling protests as my Sheffield local elections forecast video illustrates. And so on Thursday Sheffield Labour paid the electoral price of ignoring the Sheffield people, which if it continues to do so will undoubtedly act as a stepping stone to further losses at the May 2019 local elections. And given that the Amey PFI contract has some 19 years left to run then there is plenty of scope for Labour to lose overall control of the Council within a few more short election steps.